Head and brain injuries can have a dramatic impact on a person's life. Physical, cognitive and emotional effects can leave someone with a brain injury bewildered and lost without support and understanding. Headway Devon is a charity based in Exeter with a clear mission to help and support those who have been impacted by head trauma, and as part of the Positive People programme are looking towards how technology can assist in making life simpler and easier in the aftermath of a brain injury. 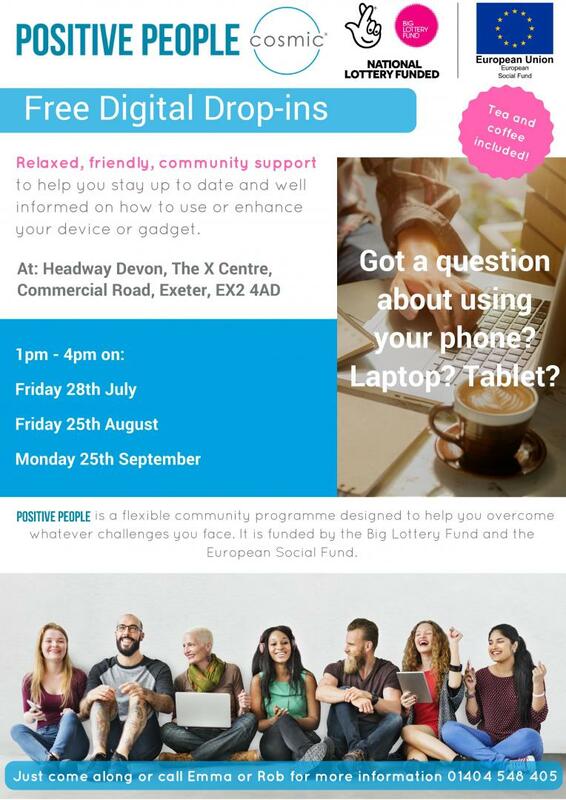 On the 28th July, 25th August and 25th September, Cosmic will be present at Headway's X Centre in Exeter offering drop-in digital support for anyone experiencing issues with their computers or gadgets - from if your laptop won't start up right through to setting e-mail on your phone, our trainers will be present to advise. The Positive People programme is a project that is aiming to help individuals who are out of work build their skills and confidence and support them on their journey into employment over the next 3 years. The scope of the project includes people with disabilities, mental health issues, ex-offenders, homeless people and people over 50. It is funded by the Big Lottery Fund and the EU Social Fund and is being run by a partnership of 7 different organisations in Devon, including Cosmic who are running the digital inclusion element of the project. Headway Devon were Cosmic's Charity of the Year in 2016, selected by a social media vote, and we have always been very happy to support their efforts in rebuilding lives after head injury. We can't wait to work with them again on this exciting project! For more information please contact Rob or Emma from Cosmic on 0845 094 6108 or Headway Devon on 01392 211822.